Well, I did what I said I was going to do. I used our Tax Returns to slam down our Line of Credit. Feels Great! We're down to owing just $6,000 and nothing is owing on our credit cards either. It'll just take a month or two and this should be cleared out as well. Renovations are coming along though we are stalled waiting for a mudder/taper to move forward. At least spring is in the air. I love all this snow melting away. Just last week I was able to submit our tax returns for 2018 and it looks like we can be expecting a combined refund of about $4,300! With all the renovations going on - it really couldn't come at a better time (despite the adage of this really just representing an interest free loan to the government). The plan is to use it to knock back our Line of Credit so we can get that paid off ASAP. The LOC mostly has leftover expenses from our back yard landscaping this past summer. Once we use the tax refund it'll take us just another month or two to get it completely paid off (again). Just for fun - here's a picture of the hottub/pergola/fence that we did over the summer which had a bit of an overrun. If you're expecting a tax refund this year, what are your plans for spending/saving it? 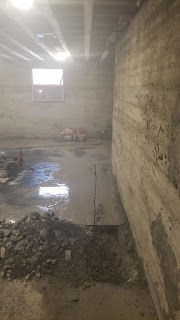 We're getting to a really exciting stage with our basement renovation. Framing is done, plumbing and electrical are mostly complete, insulation is done and drywall has started. So things are really starting to take shape. We've chosen our flooring and paint and some of the fixtures we've ordered have started to arrive. My sink and counters for the wine room and our vanity are sitting in our storage room! 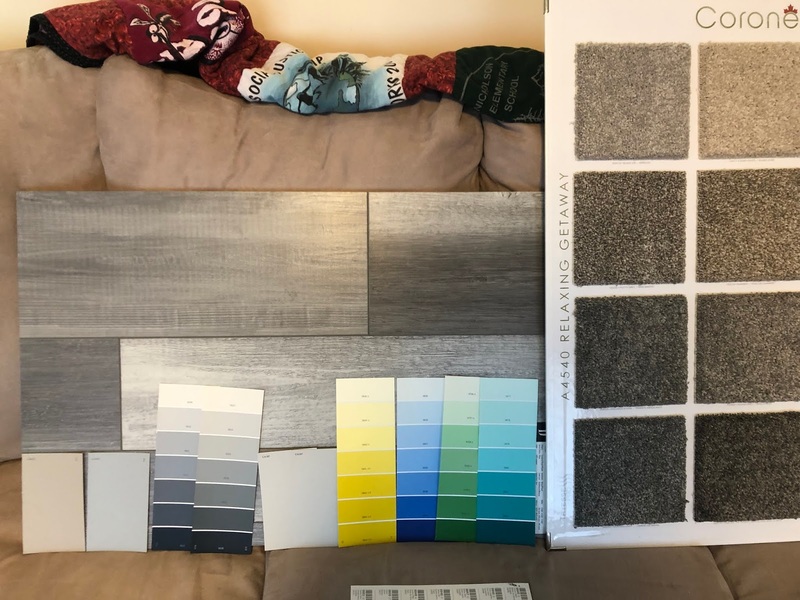 This is the luxury vinyl plank flooring we're going with and we're going with a grey carpet/walls. Some of those color paint chips are for inspiration for the bathroom/laundry which we may do a different colour. It's not pictured here but we've also chosen the tile for our Pellet Stove corner. All in the flooring quote is $10,000 (installed) for around 1,200 square feet, plus stairs. It's a bit more then we were hoping for - but the installer is also going to have to do some leveling work in the spaces where we are putting down the vinyl. We're going to be tackling painting to add some sweat equity to the project and just need to confirm timelines with our contractor so we're ready for that. It's going to be a lot of work for mostly Jordan as I'm usually on primary duty with the baby in the evening. February was a great spend month - groceries were really under control. All of the freezer/meal planning that I did back in Nov/Dec really paid off. I had prepped dozens of meals for when we brought our daughter home from the hospital. The freezer is nearly empty now though, so I'm going to need to plan a big grocery shop/meal plan again. Does anyone have any favorite make-at-home freezer meals? Some of our favorites were shepherd's pie & pulled pork. Outside of food spending - everything else was pretty in line. We did go out of town twice - which is why there is some spending on 'vacation'. "Baby" needs to be updated to "Kids" - this is clothes, shoes, hair etc. etc. anything specific for them. How did you do on your February goals? The budget for what I refer to as our day-to-day expenses is $400/week - I was trying to get this down to $300/week for the month of January but pretty much failed at that. There are five weeks in January though, and so our average came in at $398 - so not perfect, but I'm happy that we didn't go over the normal budget. The items not highlighted in grey have budgets of their own - we save monthly for things like vehicle/home maintenance, baby stuff, insurance, the renovation etc. So it looks like a lot - but really we're pretty much on target. I'm not going to post photo's of her - but she was born a week and a bit ago and is absolutely perfect. My Maternity Leave officially started on January 21st and I'm so pleased to see that my employer issued by ROE quickly and my EI claim has already been approved! I was planning on having to wait at least until beginning of March due to previous experiences with Employment Insurance - but this is going very quickly! Once I get my first payment (I'm thinking Feb 8th likely), I'll submit that to work and my 70% top-up for 15 weeks will start which is a benefit that my employer pays for. Everything is coming together....just waiting for this baby to arrive. There are five spending weeks in January but this takes us up to Thursday of the fourth. It's cumulative from the post I did a couple weeks back rather than each weeks spending re-cap. The eating out thing genuinely surprises me...but I can see it's a few times out as a family and a few times Jordan eating out for lunch. So we'll need to keep an eye on this. The other obvious big ones are Vehicle Maintenance which were the replacement parts for my windshield washer that Jordan is installing and the $2,200 in Home Maintenance which is a new washer and dryer that was on sale and is for our basement renovation. I'm thinking I might actually create a basement reno category to keep day-to-day maintenance items and the renovation separate. Is your spending on track this January? Who doesn't like pictures of renovations? Yes? No? The majority of the demolition of our basement which was previously poorly finished was completed before the snow was flying. Now that we have all of our final financing in place we were able to continue with some of the more...destructive demolition. The first step is to prep for an interior weeping tile system. We realized we were getting a bit of water wicking into the basement. For a variety of reasons, we decided with our contractor that this system would be the most effective for our home. So - to save on some costs, Jordan did the initial work to cut away the concrete and jackhammer where the system will go. The two days of labor probably saved us at least $1,000...maybe more. Next steps are to haul the concrete out, install the system, cover it back up with gravel & then pour fresh concrete. Also - so grateful for my mom. We've stayed at her place for the last two days because of the noise, dust and exhaust. Our home appraisal results are in! 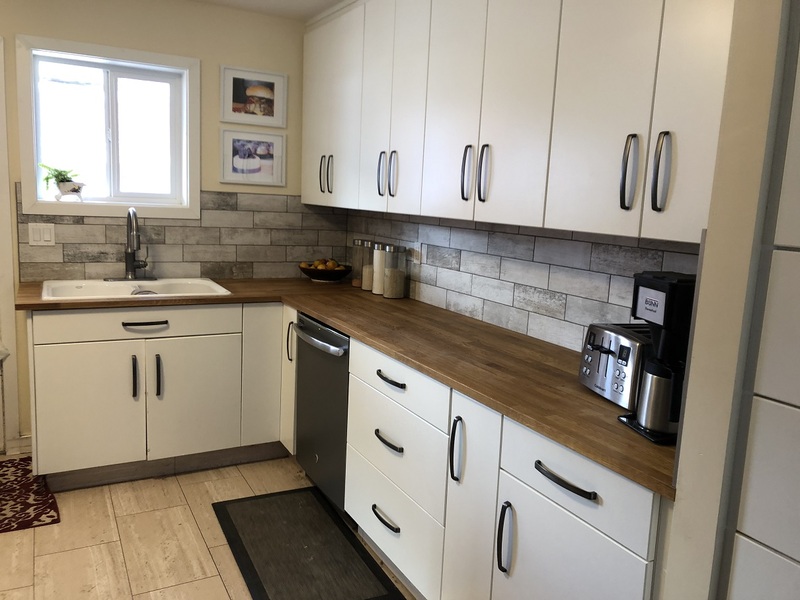 After the quoted renovations are completed, market value is estimated to be $425,000 - which is pretty much where we needed to be to get the full budget from the quote out of the equity in our home. We still very much intend on doing some of the work where we can and putting in sweat equity where it makes sense too - but this is great, great news! Two weeks into January and I wanted to post my first spend report of 2019. I think it'll be easier to stay on top of it if I do every week or two instead of just once a month - at least at first until I'm back in the swing of things. Not including the Car Insurance renewal for one of our vehicles we spent $772 in the first two weeks. Not too shabby - and would have been on target except that for months of Jan/Feb I reduced our weekly spend budget to $300 from $350 - so we overspent by $150 if I ignore the reimbursable line (which have already been reimbursed). Another nearly $50 is in banking - this is highly unusual for us - somehow in my effort to get one of our credit cards paid to $0 I missed the window to avoid interest on another. Oops!! It's very annoying. It's been years and years since I paid any interested on a credit card. Not going to beat myself up though, just going to move on and get it taken care of. The personal care item was a pedicure - a treat for myself before Little Miss arrives - so no regrets there. I've been tracking our Net-worth since 2013 and when looking at just the current year month-to-month, sometimes it feels like we have such slow (or no) movement. I enjoy end of the year posts because you can really see the long term impact of the changes you've made over the years. I think also helpful because over the course of the year you can have dips as market's change, investments change, life changes...but over the course of six years we've made such a change in our circumstances. We don't just save our money though - we see it as a tool and some money was spent! I'm sure there's more, but the point of this was just to share that we save, we spend and we try to make good choices for our family that keep us healthy and happy both now and in the future. Well, not the roof actually. Jordan just got a raise! Woohoo! Great timing with the renovations about to start and me about to go on Maternity Leave. The excitement is because we have no idea when these changes happen - is workplace doesn't do formal communications. It's just a cost of living adjustment, but it's a happy new year surprise. I actually also got a raise effective Jan 1, 2019 which is pretty great too - we'll have just one, maybe 1.5 paydays at my new rate before going on leave, but it's enough that my employer paid EI top up will based on the new rate instead of the old one. Last week I mentioned that Jordan and I are expecting eight iterations of our budget over the next year as we start/stop maternity and parental leave. Here's the high-level of the five major changes that we'll see. We're actually operating under the 'Wait for EI' budget right now. Feel free to add any comments or questions you may have - things will no doubt change (as they have a propensity to do), but this is big picture guideline for the next year or so. I'll be tracking our actual spending and posting that regularly so hoping to stay on track with that added bit of accountability. I'll also be making phone calls over the next few weeks to try to get the cell phone bill and a few other items negotiated to a more reasonable level. 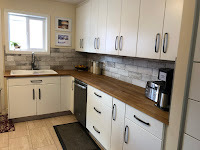 Now that we have our quote and initiated things with our bank to get started on our basement renovation, we have a decision to make about how we handle our mortgage. Current balance of the mortgage is just under $250,000 and the appraisal we had done in May of 2018 had the value come in at $365,000. We can borrow up to 80% of the value and so we have to re-appraise at $423,000.00 to get the full budget out of the house. That would then bring the mortgage up to about $335,000. I don't think we're going to get that high, but I'm hopeful we come in around $395-$410,000 the market here is really good for sellers right now plus all of the work we did over the last 8 months. On to our mortgage options - these numbers are based on the assumption that we'll get the full value from the house. Our existing mortgage is a blended rate of 2.73% until June 3, 2020: with the new amount added plus the re advance fee of $250.00 our new blended rate would be 3.20% until June 3, 2020. We currently have 206 months left in our amortization. If we keep the 206 month amortization our weekly payments would increase to $492.28. If we renewed with a 300 month amortization our weekly payments would be $377.80. We currently pay more than we need to at $350/week and once we're back to work we can comfortably handle $500/week - but we would have to get through this year which would be tight. The other day I mentioned that I've stripped back our budget to the bare bones in anticipation of waiting for Employment Insurance when I go on maternity leave. We'll have several changes to our financial picture over the next 12 months or so. I'll be taking Maternity/Parental Leave for 6 months, then taking 3-5 weeks vacation (pending approval). When I start vacation, Jordan's going to start his Parental Leave for the next six months. The plan is to overlap for the month of August when baby is six months and Little Man is 3.5 years and really spend time as a family just connecting. It will also serve as a transition before I go back to work full time.